InVersion Band - Modern Luxury Magazine's 'Best of Best' - Energetic dance floors filled with movers and shakers are InVersion's signature, as the 11 piece dance band performs everything from Motown funk to modern dance tunes. Logan and I've had a crazy busy summer so far, so I'm sorry this email is so delayed, but we just wanted to both thank you and the band for making our night seriously unforgettable. Many people said it was the best wedding they've ever been to. I could not get over how great y'all were. It was truly the best night of my life. Thank you all so much. I hope everything went smoothly on y'alls end. Let me know how I can give y'all a review, and I'll gladly refer you to anyone who gets engaged next! (: Thank you all so much, and we'll come see y'all perform soon, too! This is a fun, interactive and very talented band. Definitely be ready to enjoy some great music while you get your party on. One of the best cover bands I have ever heard. You will not be disappointed. - Marcelinda W.
AMAZING group! 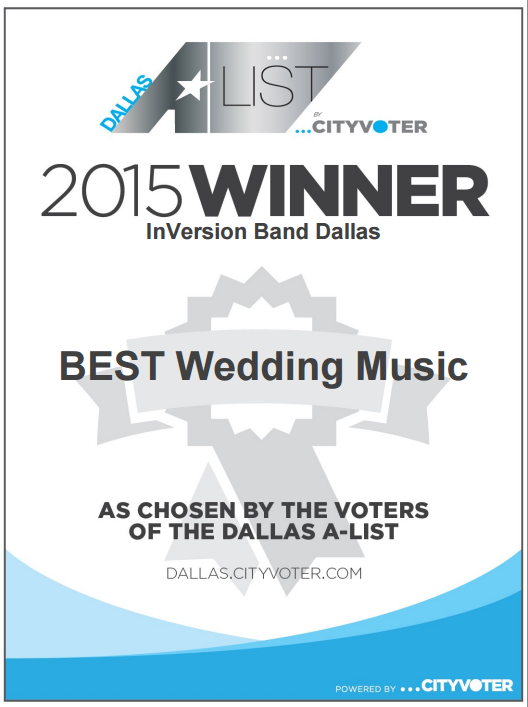 'Inversion was hired to play at our Dallas wedding reception this past May. The dance floor was packed the entire evening! They played our requests, as well as a great mix of old school and new school jams! You will not be disappointed with Inversion! They took our wedding to the next level! Most of all, they were affordable! Well worth the money!' - Taylor B.
InVersion Band named "Most Memorable Band of the Year" by Significant Events of Texas! "InVersion cranked up the party and brought an awesome party to the weddings of Taylor & Matt and Jenny & Alex. They have been fun to work with and a real crowdpleaser!" This is one of the best bands that I have seen. I love that they cover all the current top 40 as well as generational favorites. It doesn't matter if it's a wedding, club, or a community benefit, they have it covered. - Stephanie M.
Phillip, Great show at our reception! Everyone had a GREAT TIME! The band made it a night to remember! - John Z.
Hi Phillip, Hope all is going well with you and everyone in the band. We had a great time dancing the night away back on April 2nd! I have heard nothing but rave reviews for all the music and entertainment you and the band provided. I wanted to let you know that we raised $124,000 to distribute to 20 non profit organizations in Grayson County. A lot of these groups rely on these funds year after year. You guys have helped us and played a huge part in this. I also attached a short video that was done the night of the ball. Thanks again for working with us and we will talk soon! "I haven’t had a chance to send you a note until now but thank you so much for an amazing job at my daughter’s wedding. You guys did a fantastic job and hit the mark. I had a lot of people ask me who the band was and it was just a testament as to how they enjoyed your performance. Thanks again for everything, -Robert Q". 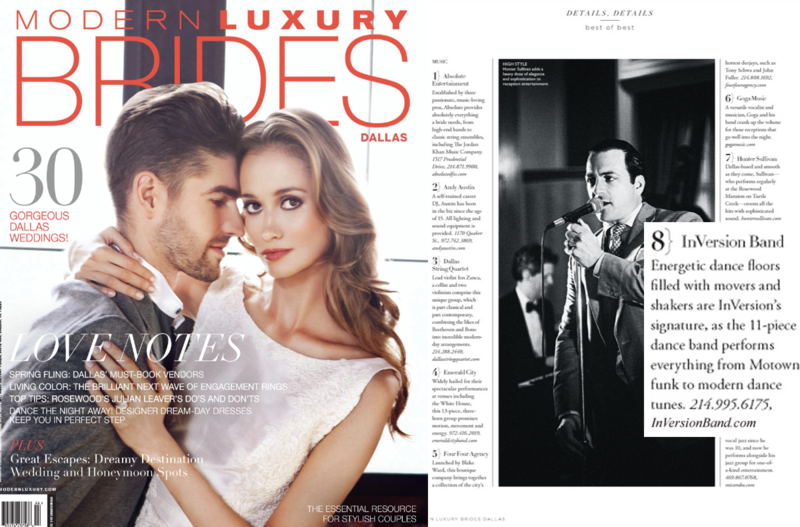 "Thank you so much for all the work you've put into the band & your generosity in making our wedding a wonderful event!" - Lane & Taylor M.
"This band played at my friends wedding and they were absolutely wonderful!! Such a variety of music, made it enjoyable for both young and older folks!" "They had a great stage feel, the music is great to dance to. They play a great mix of music from all genres, so there is something for everyone. Plus as an added bonus the band is very easy on the eyes." "Great band. They played a really awesome mix of music from groovy old to cool new stuff with good energy. I would totally go see them again." "My girl and I went and saw them at Memphis Nightclub on NYE. They are amazing! I can't tell you when I've seen a better band. We danced and sang all night. Every song was right on. FUN BAND!" "Such a talented, enthusiastic, fun band!! Their set list is full of hits that will encourage any and everyone to dance & sing along. Love this band!!" "Hi Phillip- It has taken me way too long to write you and thank you for doing such a great job at Rachel and Dayton’s wedding. People are still talking about what a great band we had at the wedding, and I’ve given out your contact information to a few people who asked for it. One of them was not even at the wedding, but has a friend who needs a band, and she said she knew we had a great one. I was so preoccupied with our guests during the reception that I did not get to enjoy the music or the show very much. Looking at the wedding photos made me wonder if I was at the same wedding? Photos of our friends singing with the band? Everyone looked like they were having so much fun. I appreciated the note you sent which was very thoughtful. And I really appreciate how hard you worked to get all the band loaded up and out of the venue with an impossible deadline. I believe Brad Howard and Nicole Shannon have you signed up for their son’s wedding in Amarillo next summer, and I am very much looking forward to seeing you again and getting to relax and enjoy it more this time.